As a member of the National Notary Association’s Member community you have dedicated yourself to upholding the highest standards of notarial practice and ethics. Now, through a new member benefit, you have exclusive access to online NNA “badges” that display your membership status, and demonstrate your commitment to notarial excellence. Developed for both NNA Members and Certified Notary Signing Agents, your online badge can be posted on your website or embedded in your email salutations. Whether you work for a financial institution, a government agency or as a mobile entrepreneur, your badge exemplifies your professionalism, builds your credibility, and sets you apart from other Notaries as a trusted, compliant public servant. 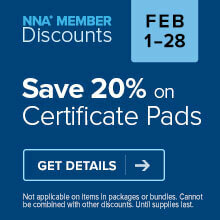 Download your badge today by logging into your NNA profile and clicking on the “NNA Logo Downloads” link. I Would like information on wearing a professional badge to my appointments.